Price: $2,200, which includes tuition, lodging, most meals, and materials. Partial scholarships are available. NOTE: REGISTRATION FOR THE 2016 SUMMER INSTITUTE IS NOW CLOSED. YOU CAN FIND INFORMATION ABOUT THE 2017 SUMMER INSTITUTE HERE. The science is clear: Integrating social-emotional learning and mindfulness into the classroom and our schools is good for both students and the adults who work with them. But why are social-emotional learning (SEL) and mindfulness good for us? How do these practices improve our overall well-being--including our ability to learn, prevent burnout, and develop positive relationships? How can we cultivate social-emotional and mindfulness skills in both our students and ourselves and encourage colleagues around us to do so as well? What gets in the way of developing our social and emotional competencies, and how can we overcome those challenges? This six-day, five-night retreat gives education professionals from all over the world the opportunity to dive into the science and practice of social and emotional well-being in order to better understand how to cultivate this well-being within themselves and their students. In addition to brief lectures, participants will engage in deep self-reflection, thought-provoking discussions, and collaborative strategy sessions as they consider how this science applies to pedagogy, classroom and school climate, stand-alone lessons, curricula, staff development, and their own personal development. They will also have the opportunity to informally share their own SEL and mindfulness practices with each other. In order to form a strong support network—one that will last long after the Institute is over--participants will be divided into “families” of eight to ten that work, explore, and play together throughout the six days. Participants will also have plenty of opportunities to connect with other educators outside their families. 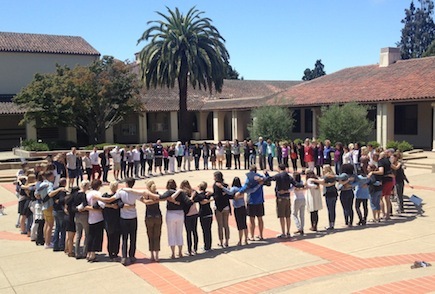 In addition to this support network, participants will leave empowered with cutting-edge, science-based social-emotional and mindfulness strategies, tools, and techniques to implement this important aspect of student and teacher development in their school environments. They will also leave with a deeper understanding of who we are as human beings. To apply, please click on the “Application” tab and fill out the on-line form. The application deadline is midnight on January 15, 2016. Applications submitted after January 15th will automatically be placed on the wait list. This year, for the first time, the Summer Institute for Educators will offer three separate sessions, with up to 75 educators attending each session. This will give the Summer Institute a more retreat-like feel and will allow for deeper and more personal exploration of the topics. Session 1 will run from Sunday, June 26 - Friday, July 1, 2016, Session 2 will run from Friday, July 15 - Wednesday, July 20, 2016 and Session 3 will run from Sunday, July 24 - Friday, July 29, 2016. Each session will take place in the same location and will offer the same content. Parking permits are available for $84/session. The application deadline is midnight on January 15, 2016. Applications submitted after January 15th will automatically be placed on the wait list. Non-scholarship applicants will be notified of admission by January 25, 2016, via email. We ask that you kindly let us know by February 8, 2016, if you will attend. Your payment will be due in full (via check or credit card) on February 22, 2016. Scholarship applicants will be notified of admission by February 25, 2016, via email. We ask that you kindly let us know by March 10, 2016, if you will attend. Your payment will be due in full (via check or credit card) on March 24, 2016. If acceptance into the program falls less than 90 days prior to program start date, your payment will be due in full (via check or credit card) upon acceptance. $2,200 per participant. This includes tuition, materials, room, and board (all breakfast and lunch meals included). Participants are responsible for their own travel expenses and arrangements. If you are unable to pay the full amount, we ask that you first check with your school/organization to see if they will cover any of your costs with professional development or other funding. If your school does not have funding, or their funding does not cover what you need, we may be able to provide a partial scholarship to help offset the cost of attendance. In the case that your school does not provide any funding, you will need to submit a letter from your principal, district administrator, or organization supervisor confirming that there are no funds available to support your attendance at the Summer Institute for Educators. The Greater Good Science Center is completely funded by donations and grants -- we do not receive any financial support from the University of California-Berkeley. As such, we have limited funds available for scholarships and cannot offer full scholarships. In order to be as fair as possible to all applicants and create the most opportunity we can with the scholarships, we ask applicants to request the minimum necessary. Based on past participant feedback, the majority of the Institute will be facilitated by a smaller number of faculty than previous years. With this change, more time will be spent on the practical application of the science into pedagogical methods, classroom climate, stand-alone lessons, curricula, staff development, and personal development. Participants will also have the opportunity to share their own best practices with each other. Brooke D. Lavelle Heineberg is the Co-Founder and Executive Director of the Courage of Care Leadership Council, a non-profit organization dedicated to providing compassion training programs and support to individuals and communities in education, health care, and other areas of social service. She is also Senior Education Consultant to Mind & Life's Ethics, Education, and Human Development Initiative and a co-developer of the Call to Care program for teachers and students. Brooke holds a PhD in Religious Studies and Cognitive Psychology from Emory University. Her academic work focuses on the confluence of Buddhist contemplative theory and cognitive science, as well as the cultural contexts that shape the transmission, reception, and secularization of Buddhist contemplative practices in America. While at Emory, she served as a lead instructor for several studies examining the efficacy of Cognitively-Based Compassion Training (CBCT), and has helped to develop and adapt CBCT for school children as well as adolescents in Atlanta's foster care system. In 2010, she helped developed the CBCT Teacher Training Program, and served as associate training director. Brooke earned her BA in Religion and Psychology at Barnard College, and her MA degree in Religion at Columbia University. While at Columbia, she also worked as a Research Coordinator for the Columbia Integrative Medicine Program, where she developed and taught yoga and Mindfulness-Based Stress Reduction (MBSR) programs for a variety of clinical populations. Brooke serves on the Board of the Foundation for Active Compassion and works as a consultant at the Center for Compassion and Altruism Research and Education (CCARE) at Stanford University and the Greater Good Science Center (GGSC) at UC Berkeley. All three of the 2016 Summer Institutes for Educators are full and we are no longer accepting applications for the wait list. Please check again in the fall for the 2017 application.